Summary: Would you ever appreciate an adulterated, maneuvered version of DDLJ no matter how promisingly interesting it seemed to be? I assume you answered negatively, for there are plenty of other Young Adult Romances, which fill up the readers’ need to feel and associate with a story through words. This one was a big time failure and since the book was my first ever read from Durjoy Dutta, I, now, find zero motivation to move on to his other writings. My take: The first attempt at naming the title goes awfully wrong; striking out the word, ‘worst’, to replace it with ‘best’ gives such a cheesy ting to the noun, boyfriend that it almost makes the complete story predictable. 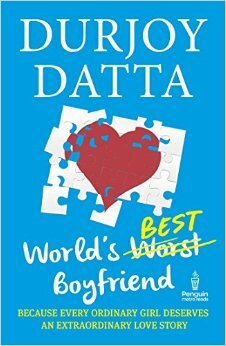 Durjoy Dutta seems to be painfully wowed by coming-of-age authors like Chetan Bhagat, Ravinder Singh, Preeti Shenoy, Novoneel Chakraborty, Anurag Garg and many others that he has opted for the same path they all trod on. The ‘so to say’ love story revolves around a girl, Aranya, who suffers from vitiligo and considers it as a burden she’ll have to carry for life, and a boy, Dhruv, who has a reason to act the way he does – a disturbed childhood. The story is distributed in 81 small chapters, which all end leaving a question mark, thereby prompting you to move on to the next chapter. The writing style of the author is simple, easy-to-grasp and extremely colloquial. I believe he could have done a way better job had he not used the negative words, like f*ck, ugly, fat and bhench*d, tad too much. These seriously turn the readers off and discourage them to read any further. Additionally, though the story is intriguing and pushes you to read till the last page, a lot of times it seems more of a drag and the reader seems to feel the weight of pages as quite heavy to turn. Half way into the book and you have a clear idea how it is going to end; therefore, it is more of a predictable story where everything is happy through the end. Besides, there are certain aspects of the tale which are completely beyond one’s grasp and rather fill you with rage; for instance, why does the girl, who is a master of her forte, not filled with enough clarity to clearly define how she feels – there are plenty of shades of grey in the way she feels; why Dhruv, who is Casanova himself, doesn’t accept her lady being promiscuous; why Aranya, despite being mentally strong to ward off a boy who she has very strong feelings for, has no power to speak in front of her parents and why the author wants to portray all the disease part extremely negatively, although Vitiligo is no serious disease and I have seen big time achievers in my life who never really “suffered” because of this. Lastly, you would find this a great way to kill time if that’s all what you have been wanting to do. You could, surely, choose this over watching a cheesy Govinda romcom, but if you have been an avid John Green, Rainbow Rowell or Gayle Forman fan, this book is NOT for you. Final word: This book could have gathered a lot of ‘awws’ from people who love amateur YA romance, but to a more mature reader, this book would appear a clichéd love story with nothing new to offer to the reader. The story is not something unheard of and the execution also appears hurried and messy. I am sure Durjoy Dutta has a lot of ‘female’ fan following, but so does have Rahul Gandhi and we, know, now, why and how!